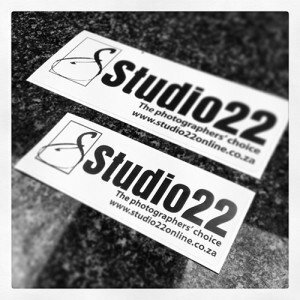 Studio22 is synonymous with printing and sticker printing is no exception. Printing only with genuine archival inks and using long-life European vinyl, your stickers and labels are of the highest quality. Services include a ‘kiss cut’. 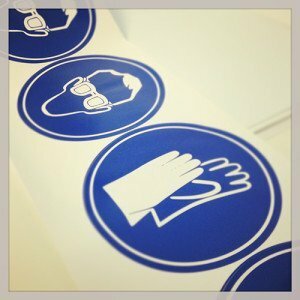 Kiss cut allows you to lift the sticker off the backing sheet while cutting to almost any shape you require. You can supply your own design or one of our design crew will gladly assist in creating the sticker you are after. To give you an idea of how well priced our stickers are, we have included a small chart of popular sizes and quantities. Our minimum order is R150. For 1st time orders, we recommend a proof print, orders processed without a signed proof are not reprinted or refunded. All printing is for full colour or black & white: available on matt, gloss or clear vinyl. The prices below include kiss cut and die cut fees. 90x90mm is a typical licence disc sticker. 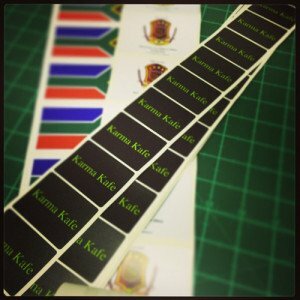 Sticker printing Cape Town. Studio22 offers an extensive range of printing services and products. Banners, signs, menu’s, stickers, labels, posters, fine art and canvas. As photographers, we understand true photographic resolution. We would never sacrifice quality for quantity. It is easy to meet any deadline with an ink printing system by simply dropping the print resolution and turning up the speed. We would rather not print an order than make that sacrifice. Try us. We operate three large format printers side by side, this increases our work-flow and means you can get your prints on time.